There isn’t even officially a name for it. Frankly, it’s too ghastly to have a name. For the purposes of this column, we’ll call it the Horrible Sound. You only hear the Horrible Sound during especially big games, and only if something unthinkable happens to a good player on the home team. If you think of noise being measured from 1 to 10, an especially big game carries a particular buzz that never seems to fade. It’s like the last few seconds before a concert when they shut the lights out, only the band hasn’t emerged yet. That’s just how it sounds for two and a half hours. If something unthinkable happens to one of the home players, that ongoing, this-game-is-bigger-than-all-of-us buzz doesn’t screech to a stop like a record being halted. Rather, it fades over the course of a few seconds — like someone is slowly turning down a knob that controls the crowd volume from 8 to 7 to 6 … until finally, you’re at 1 and everyone in the building is standing in shock. It’s awful. It’s one of the worst experiences you can have at a sporting event. See, fans are selfish that way. Pierce might have blown out a knee or broken a leg, but we were thinking about our improbable, once-in-a-generation Lakers-Celtics Finals going down the tubes. Watching from 40 feet away with my father, Dad just kept muttering, “no … no … no … no …” We all felt that way. 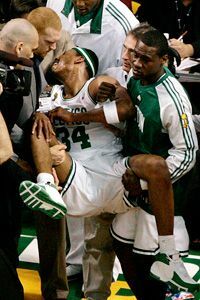 That’s what made it so painful when it seemed like Pierce was finally standing up (volume going back up to 2, then 3, then 4 …), only we realized he wasn’t actually standing but being carried off the court by two teammates. Brian Scalabrine had one of his legs, Tony Allen had the other. Pierce’s arms were draped around their necks. They hurriedly schlepped him off like a wounded soldier on a battlefield. When I was 6 years old, Freddie Lynn crashed into the outfield wall at Fenway during Game 6 of the ’75 World Series and slumped into a heap like he had been taken out by a sniper. That was the all-time Horrible Sound in Boston sports history. This was second. For Pierce’s mysterious injury to happen during Game 1 of the Finals, right after he had caught fire in the third quarter, right as everyone was beginning to embrace the full power of this Celtics-Lakers renaissance, was simply incomprehensible. We had the same look on our faces as the castaways in “Lost” when they thought they were getting rescued, only it starts dawning on them that the “rescuers” in the helicopter might not be there for the right reasons. Really? I’m not getting off the island? I’m stuck here? For all the hype that comes with a throwback Celtics-Lakers series, you couldn’t fully grasp its significance unless you were in Boston on Thursday. Walking around Causeway before the game, the street was effectively covered in green — just guys in their teens and 20s happily walking around in green T-shirts and jerseys, randomly chanting “Beat L.A!” and “Let’s go Celtics!” The bars were teeming with locals, many of them distracted by a timely Red Sox-Rays brawl that put everyone in the right mind-set for seven games against Kobe and the Kobettes. At the intersection in front of Causeway and Canal, there was a 25-foot replica of the NBA’s golden championship trophy, with about 25 crazed Celtics fans flanking it and starting various cheers. Six especially creative Boston fans were walking around dressed like members of the ’86 team — Bird, McHale, Parish, DJ, Walton and Ainge — wearing especially tight jerseys and shorts and corresponding wigs for each player. You always hear the phrase “happy to be here” about teams, but this might have been the first “happy to be here” fan base. The really cool part: You had one generation old enough to remember the significance and awesomeness (for lack of a better word) of the whole Celtics-Lakers thing, as well as another generation of under-25 fans who lived the rivalry secondhand through ESPN Classic, grainy VHS tapes and stories from parents, grandparents and older brothers. The first generation was grateful because they never thought they’d see the rivalry renewed; the second generation was grateful because they had grown up thinking, by sheer luck of the draw, they missed out and that was that. In fact, that’s the perfect word. Grateful. If anything, the new generation was more euphoric than the old generation — imagine hearing those stories and watching those replays for two solid decades, always wondering what it would have been like to be there, never believing it could happen again. And then a window opens and, just like that, you’re there. The whole thing was a little hard to fathom. You’d think Boston fans would have been nervous heading into Game 1 of the series as legitimate underdogs, but you couldn’t feel any tension whatsoever. I’d use the word “giddy.” Even the normally grouchy media seemed happy to be there. And beyond the rivalry or the nostalgic clash of uniforms, I have to say the night just felt bigger with Kobe involved. He’s one of the most recognizable athletes alive, the best basketball player in the league, someone who just seems inherently famous at all times. Since this had been such an impossibly tough ticket, the happy-to-be-there factor was through the roof. For season-ticket holders who shelled out sizable checks annually for a never-ending edition of crappy teams — like my father, for instance — you could see the vindication in their eyes. This is why I kept my tickets. For everyone working for the Celtics since the unfathomably cold, clumsy and impersonal Paul Gaston era — like my buddy Sully, for instance — you could see the relief in their eyes. This is why I kept working for them. For the fans who kept supporting the Celtics from Reggie Lewis’ death through the reprehensible tank job last season — a 14-year stretch that had fewer highlights than Pauly Shore’s IMDB.com profile page — you could see the collective twinkle in their eyes. This is why I kept watching. And for the wealthy fans who didn’t care about the Celtics as much as flexing their financial/social muscles so they could show up to either be seen or tell other people they went — and there were more than a few of them — you could see the satisfied look in their eyes. This is why I worked so hard to become successful. So that’s where we were heading into Game 1: Relieved, giddy, happy, excited. During the first half, Boston’s obvious advantages in this series surfaced (homecourt, rebounding, L.A.’s lack of anyone who can defend Garnett), as well as the disadvantages (the Celtics don’t have plays, no transition baskets, no backup point guard, Doc Rivers). At halftime, despite a putrid first half from Kobe, the Lakers were leading by five. Not a good sign. Then Pierce came out firing, scoring eight quick points to reclaim the lead. Just when it looked like we were headed for a potential “Hardwood Classic,” the Horrible Sound happened and Pierce got carried off. After that, there were about five minutes when my father and I were staring on the court, absorbing everything, trying to digest the thought of a Pierce-less Celtics for the rest of the Finals, attempting to find an adequate reaction, and just repeatedly locking eyes and shaking our heads grimly. Unfortunately, the Celtics botched the timing of Pierce’s dramatic re-entrance, having him return right before an extended TV timeout. (Note to ESPN Classic: When you show this baby, edit it so it seems like Pierce came out and went right back into the game.) No matter. We were alive. And when Pierce nailed consecutive 3-pointers later in the quarter, the roof practically blew off. Unfortunately, the fourth quarter didn’t live up to the promise of the first three: The Lakers went ice cold and the Celtics couldn’t get a decent shot. I can’t tell you if it was great defense or incompetent offense; maybe it was both. There was one excruciating stretch with Boston leading 86-78 when Sam Cassell decided to remind us why he shouldn’t be playing in this series, taking a couple of truly horrific shots and prompting a chorus of “Ronnnnnnn-do!” yells while a standing Doc Rivers flatlined on the sidelines for about two minutes. This has been a Doc staple over the past four years — a Celtics player submitting an absolutely catastrophic stretch of play as Rivers leaves him in for about 90 seconds too long, then suddenly realizes, “Wait, I’m the coach, I have the power to remove this guy from the game!” By the time Sam finally got pulled, we were up only four points with six minutes to go. Just when it seemed like Kobe and the Kobettes might steal the game, they started throwing up brick after brick. I have to be honest: The Lakers looked nervous to me. Odom looked nervous. Radmanovic looked nervous. Farmar looked like he might throw up on the court. Gasol didn’t look nervous, but he allowed himself to get taken out of the game because of a few calls. (By the way, kudos to Gasol for being the first professional basketball player in the history of mankind who has never committed a personal foul. What an amazing achievement.) And Kobe looked like — I gotta say it — he was pressing. The Celtics were throwing multiple guys at him, bumping him, jumping out at him and contesting every jumper, and once he realized he wasn’t getting charity calls, he stopped driving to the basket completely. A. The Lakers weren’t stealing Game 1. B. We might have a series on our hands. And we do. The Lakers might be a wonderful offensive team, and they might have the best player in the league, but they have legitimate rebounding/size issues that didn’t totally surface until Thursday night, when they were outrebounded by 13 and never seemed to get any tip-ins or follow-up shots. It’s also a team with only one penetrator/creator (hint: it’s the guy who was being serenaded with “No means no!” chants Thursday night), and if you can keep him out of the paint and hope the officials don’t save him with charity calls, and if you can keep throwing effective double teams at Gasol on the low block, then the Lakers have to live and die by jumpers. At home, you can survive that way. On the road? No. That’s why they lost Game 1. Heading into the series, I thought Boston could win for three reasons: Size, defense and homecourt. That’s really it. All of those factors were on display Thursday in a nerve-racking game Boston never totally put away. If there’s a quality unique to this Celtics team, it’s its lack of exclamation-point sequences. Usually a great team will have those little 8-0 or 12-2 runs capped off by a steal, a fast break and either a dunk, a layup or a 3-pointer, followed by an opposing timeout and the crowd going absolutely ballistic. (Bird’s Celtics teams were defined by those exclamation-point sequences.) These particular Celtics never seem to have them; instead of knocking someone down with a haymaker, they just throw a ton of punches and hope the sheer volume will take the scorecards. If they were a boxer, they’d be Joe Calzaghe and not Kelly Pavlik. It’s a little unorthodox, and it takes some time to get used to, but ultimately you get used to it. That’s just who they are. Of course, they’re nothing without Paul Pierce. He’s the most clutch guy on the team, its best all-around player and one of its two emotional leaders, as well as the one current Celtic who belongs to the fans and bridges Before and After, the guy who survived Rick Pitino, Chris Wallace, Vin Baker, Ricky Davis, Theo Ratliff’s Expiring Contract and everything else. For Pierce to get knocked out of this series within three quarters — the guy who understands the L.A.-Boston thing better than anyone, the truest of true Celtics, the guy who sacrificed the most to get here and appreciates what’s happening the most — would have been an especially cruel turn of events. Maybe that’s why, as everyone was leaving the Whatever The Hell The Garden Is Called on Thursday night, there wasn’t the usual sense of jubilation after a Finals win. You could feel the collective relief emanating from the exit tunnels, a few scattered whoops, some murmuring and that was that. Pierce was OK. The Finals hadn’t fallen apart before it even really started. We had survived the Horrible Sound and lived to fight another day. Time to exhale and keep breathing.